I really like Designs For Health Probiophage DF and think it’s a solid daily probiotic supplement to help promote a healthy GI and immune system. It’s easy to use and you only have to take my capsule daily with a meal. I love when it’s just one and done and I don’t have to worry about taking a handful of pills everyday. The capsules are also smaller than average and were easy to swallow. I like that this probiotic uses a prebiotic in the formula. Prebiotics are important and they feed the probiotics and help keep them alive. 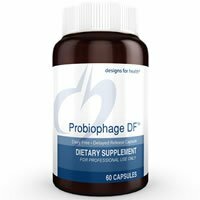 Probiophage DF also has delayed release capsules, which is so important because it helps get the friendly bacteria where they need to go and protect them from stomach acid. I also felt good while taking this probiotic and noticed that some of my Irritable Bowel Syndrome (IBS) symptoms were lessened. A few things to keep in mind are that you may need to refrigerate the bottle in order to keep the cells at their maximum potency. Also, I couldn’t find any sort of satisfaction guarantee, which was a let down. However, I think this is a good probiotic supplement and has a lot of positive qualities to it that could potentially help out with digestive and immune function. Every capsule of Probiophage DF contains 5 billion cells in 7 different probiotic strains. I like that it uses Lactobacillus acidophilus, in particular. This probiotic has been researched quite extensively in studies and is commonly utilized in probiotic supplements. It’s also a personal favorite of mine and seems to work the best with relieving my symptoms from Irritable Bowel Syndrome (IBS). Studies suggest that Lactobacillus acidophilus may potentially relieve the symptoms that come along with gut dysbiosis, Irritable Bowel Syndrome (IBS), and Crohn’s disease, such as bloating, gas, and constipation. Lactobacillus acidophilus may also help prevent traveler’s diarrhea, treat yeast infections, and reduce urinary tract infections. I also like that Bifidobacterium longum is used in the strain profile. Bifidobacterium longum has anti-inflammatory properties, which are suggested to help protect your immune cells so they can mature and function optimally. This strain may also help lower seasonal allergies and reduce cholesterol levels. Designs For Health Probiophage DF doesn’t have any allergy concerns listed. It’s also dairy free and gluten free, which are definite pluses! I really appreciate when products are allergy friendly because so many individuals suffer from food allergies or sensitivities. The other ingredients include: delayed release capsule (hydroxypropyl methylcellulose [HPMC], water, gellan gum), medium chain triglycerides. It costs $48.00 for a bottle of 60 capsules. The bottle will last you 2 months, since you only take 1 capsule daily. It works out to be $0.80 per day to take this probiotic. This is slightly above average as far as costs go, however nothing crazy. I think it’s a great value for the price! While I was taking Designs For Health Probiophage DF, I didn’t notice any negative side effects at all. I actually felt good the entire time I was taking it. I was definitely happy about that! This probiotic is great for daily use and isn’t overly potent like a lot of other probiotic supplements (which tend to leave you with icky side effects). I wasn’t able to find any sort of guarantee for Designs For Health Probiophage DF. I really like when companies can offer at least some type of money back or satisfaction guarantee for their customers. I couldn’t even find a return policy for the products. To buy Designs For Health Probiophage DF, click here.